Many thanks to Emma (http://wordsandpeace.com/) for her recommendation of Holidays on Ice by David Sedaris! I really get a kick out of the way Sedaris has of taking the absurd to new levels of hilarity. This book contains a collection of holiday stories which I found to be extremely funny. If your family sends family update letters with your holiday cards every year, you’ll really enjoy the one Sedaris wrote for this book. The story about a theater critic writing reviews of local Christmas pageants was even funnier! I had tears in my eyes when I read the piece about the time he worked as an elf in a New York department store. There are several other stories in this short book which will fill your heart with laughter as well. I’m so glad for the recommendation of this book and award it five golden rings. 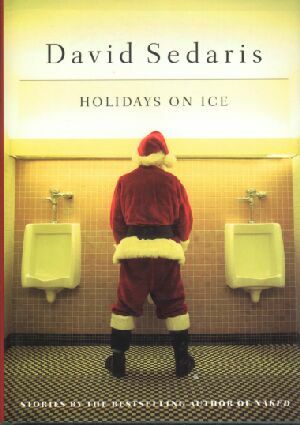 This entry was posted in Uncategorized and tagged Books, Christmas, David Sedaris, Holidays on Ice, humor, Santa Claus. Bookmark the permalink. Thanks again for the recommendation! It was such a funny book! I’ll take your advice and pass on the new book. Ho ho ho….